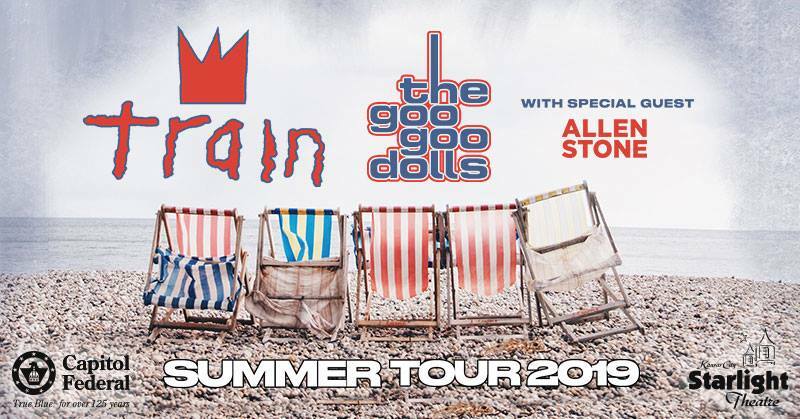 Starlight Theatre welcomes Train and the Goo Goo Dolls on Friday, June 21, 2019, as these two hit bands roll across North America in 2019. Multi-platinum roots rock band Train formed in San Francisco in 1993 and saw mainstream success with its debut album in 1998. Their second album, 2001’s Drops of Jupiter, featured the single “Drops of Jupiter (Tell Me)," which took home two Grammy Awards in 2002. That album remains the band’s best-seller worldwide. Train earned a third Grammy in 2011 for the worldwide smash “Hey Soul Sister” from their fifth album, Save Me, San Francisco. The song was the biggest-selling single of 2010, hitting No. 1 on the radio in the United States and 15 other countries. Train recently released a new Greatest Hits album. Since 1987, the Goo Goo Dolls have performed in front of millions of fans in concerts around the world, received numerous awards, including four Grammy nominations, and performed multiple times on nearly every late-night talk show. Guitarist and frontman John Rzeznik in 2008 was honored with the Hal David Starlight Award from the Songwriters Hall of Fame, and the band was inducted in 2013 into the Guitar Center’s Historic Hollywood RockWalk. They released Boxes, their latest album, in 2016.